So this is not my typical belly picture. This is my costume from the belated Halloween party (if you are wondering why the hell I attended a Halloween party 2 weeks late, read this post to catch up). I forgot to take a 31 week belly pic yesterday, so this will have to suffice. Pardon the picture quality; it’s from my husband’s cell phone and his phone doesn’t have the best camera. Total weight gain/loss Up a whopping 28 pounds as of last appointment. Yikes. Stretch marks? OMG. Yes. Tuesday night, I discovered some on my hips. Not really my belly, but the side where my belly meets my hip. SOB. Sleep Is a distant memory. Best moment this week Our BABY SHOWER! Movement She moves.. A lot, when she wants to. She has no pattern, no routine and sometimes I have to sit there and shake her to make her move. I did that this morning, and she sleepily woke up, got the hiccups and then started kicking the HELL out me. I was happy. Food cravings Nothing huge this week. What I miss 8 hours solid sleep! What I am looking forward to Meeting my little girl! Milestones IDK, is 31 week a milestone? Hehe. Hey girlie girl! Still loving the blog. I wanted to say I stole your button and put it on my site. I got a button made too so if you'd like the code for it. Of course I can't figure out how to post it so it doesn't show the button. Thanks. BTW how do you get the little box to hold the code for your button. I can't figure it out! GREAT costume! Definitely a baby in there.28 lbs since last appt? Are you kidding??? When was the appt, umm, July?! Have they warned you about pre-eclampsia and all that good stuff? Dina – Here's the code to put a text box on your page:(textarea rows="4" cols="50" name="comment")(a href="http://YOURWEBSITEADDRESS&quot;)(img border="0" src="http://YOURIMAGECODE"/)(/a)(/textarea)Obviously, you want to replace the () with <> tags. Let me know if there's a problem with the code; I just copied and pasted from my HTML box on my website. Nicole – No no no, I've gained 28 pounds total. My doctor hasn't said anything about my weight and my blood pressure has been consistently really great; my last appointment it was 120/65. That's exactly where I got my stretch marks!! I had zero on my belly but on both sides of my "love handles". They are very slowly fading now. 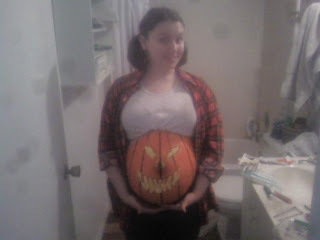 I just LOVE the pumpkin belly. So cute! I cannot believe you're 31 weeks now. It goes by really fast from this point on. Thanks Natalie! I got it now! Appreciate it! I love this picture too!! How fun!